TOMS RIVER, NJ (August 2, 2004) – Although the recent completion of the 2004 summer season for the Jersey Shore Boca Under-23 and Under-19 men’s teams brings an end to the summer soccer season, it also marks the beginning of an exciting time of year for Boca’s collegiate players as they prepare to pack-up and head-off to their respective schools to begin training camp this month for the upcoming college soccer season. Jersey Shore Boca standout Danny Haydu defends against a Cherry Hill United player in a U23 MSSL game at Ft. Dix on July 24th. Haydu, who will be entering his freshman year at Monmouth University is among 43 Boca players who will playing NCAA college soccer this fall. Jersey Shore Boca will have forty-three club standouts that previously played for Boca on either their Men’s, Super Y-League, Premiere Development League, Club or Youth teams, who will participate in NCAA intercollegiate soccer this fall for their respective institutions. Fourteen of Boca’s forty-three players will be seeing college action for the first time as freshmen while thirteen players will play at the NCAA Division I level his year. Three Boca players will also be making transitions from an old school to a new one. 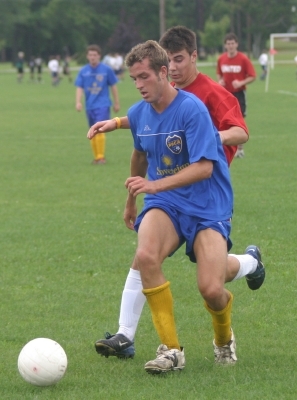 Leading Boca’s freshman class are 2004 graduates Danny Haydu of Toms River (Toms River East), Joe Cutler of Manahawkin (Southern Regional) and Jon Curry-Edwards of Spring Lake Heights (St. Rose), all three of whom, who are headed to NCAA Division I schools, played on the Boca U-23 men’s team this past summer in the Mid-Atlantic Summer Showcase League. Haydu, a tough defender, begins his college career at Monmouth University while Cutler, a forward, travels to Rider and goalkeeper Curry-Edwards heads to Old Dominion University in Norfolk VA.
“Danny, Joe and Jon all held their own this summer with our U23 team. They had the opportunity to play against some of the top college players in the region and did very well against them. I believe they were able to gauge what worked at this level and what they need to improve upon before their college camp begins” said Walt Konopka, a member of the Jersey Shore Boca Board of Directors who coached the Boca U23 team this summer. Three Boca players who also played with Boca’s U23 team during the summer will be transferring to new schools this year. Sophomore George Gkionis (Jackson Township) who played last year at Drexel University will have three years of eligibility left as he joins his younger brother Nick at Stevens Institute of Technology. Another sophomore Will McMaster (Rumson) who played in all eighteen games as a freshman last year at Randolph Macon College (VA) hopes to gain a walk-on roster spot at Loyola College in Maryland and Senior John Mortiz from Tuckerton, heads closer to home from Caldwell College to Richard Stockton this year. Two former Boca players Chris Konopka (Toms River) and Chad Severs (Ocean City) who were inaugural members of Boca’s 2003 PDL roster continued playing in the nation’s top amateur soccer league this summer as they were signed by the Jersey Falcons and Reading Rage respectively. Severs, who enters his senior year at Penn State University, played in 11 games for the Rage this summer scoring 5 goals and tallying one assist. Konopka will be entering his sophomore year at Providence College in September. The 2003 Toms River East High School graduate started seven games between the pipes for the Falcons. He logged 594 minutes in eight total games, made 58 saves and allowed 15 goals in PDL action over the summer. The standout goalkeeper was also named to the roster of the Under-19 US Soccer Regional Team three times during 2004 and has competed in 14 national and international games with the US Regional Team in 2004. “The goal of any collegiate soccer player over the summer should be to practice in a highly intense environment, keep their fitness and strength up and play games at the highest competitive level possible. Our club has historically provided this type environment to our college players and this year was no different. Any player who participated on our U-23 or U-19 teams this summer experienced some of that environment. Our Directors, Coaches and Staff wish all of them the best of success this college season” finished Coach Konopka.